The story begins as a fairy tale, a myth from the depths of time. Much talk, no one has tasted, or so little, this wonderful oil that makes the female body smoother than the skin of a peach and giving it food seasoning, flavor worthy of the table the gazelle-eyed houris. There was once a happy valley with tall trees at the gates of the Maghreb, the Souss valley, between Agadir and Essaouira, between the ocean and the Great Desert. Ripened in the sun of a zone free of chemical treatment of soil, fruits provide a liquid blonde natural. Throughout the world, increased biological trends in cosmetics tends to emphasize the use of natural products and ingredients. In the purest Moroccan tradition, Argan oil has always featured prominently in the magnificence of women: body care, anti-wrinkle mask, bath for brittle nails and hair care to restore luster and shine to your hair . It rebalances dry, dehydrated skin and, as demonstrated by scientific studies, revitalizing its power allows it to resume vital functions of cells, to restore the skin barrier and neutralize free radicals. This is a wonderful antidote to the natural skin aging. 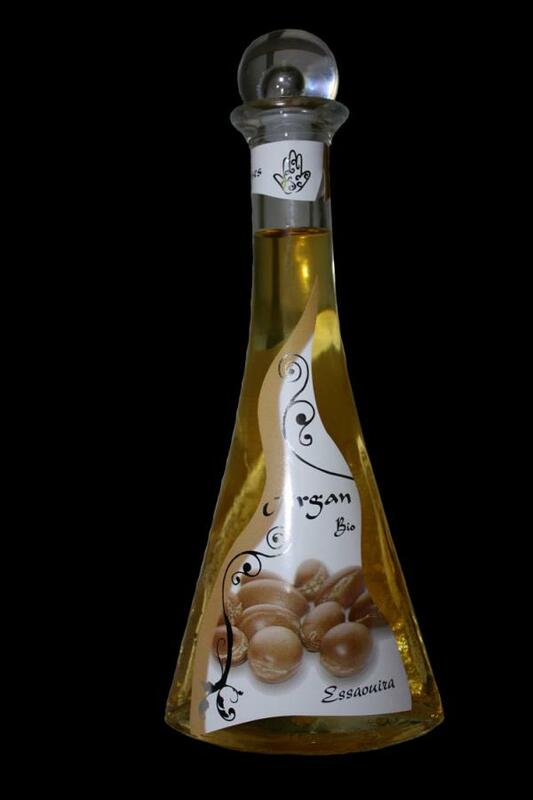 Argan oil restores and strengthens brittle nails and split. Used in the bath water, it softens the skin and, in small amounts applied to wet hair, it gives them luster and shine. Article completely natural without chemical preservatives, parabens or phenoxyethanol, and we refuse are against testing on animals exercised. DESPINOU ZISOU : Ma peau a changé de texture dès la première application, nourrie, hydratée on voit le résultat de suite, pour les vertus anti-âge, j'attends un peu et vous donne le résultat.